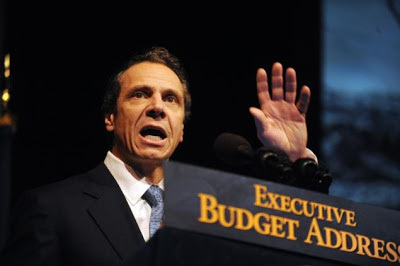 Remember what was in the 2013-2014 NYS Executive Budget? Go and remind yourself of Governor Cuomo's ideas for Early Intervention!! Providers, please remember! If the Governor had his way you would have been negotiating rates directly with third party payors. NOW they say "Go ahead and just accept whatever they are willing to pay." NEXT YEAR they will probably try to put this language in again - and then you will regret JUST ACCEPTING whatever they are willing to pay. Sorry for the CAPS, but everyone needs to understand this and write a letter to the Bureau of Early Intervention and tell them that you WILL NOT just accept what third party payors offer and that there MUST be some allowance for negotiating reasonable rates because we KNOW what the State's intention was and we KNOW that all this is still heading down the same path as soon as the Governor has another opportunity to submit his ideas in an Executive Budget next year! OK so there are days when I start wondering how many years I am going to spend crawling around on the floor with children. Sometimes I just wonder how many miles are meant to be crawled in a lifetime. This leads to thoughts about how appealing academia might be where I can spend a greater amount of my time sitting instead of running/hopping/crawling/etc. The concept of telerehabilitation appeals to me - instead of/in addition to academia maybe a career in telerehabilitation is another option for my decrepit knees? I have no inherent bias against telerehabilitation; in fact, I kind of think it would be great to find out that some types of OT treatment could be effectively delivered in a distance format. Child passenger safety: A question about the epistemic culture of occupational therapy. Well. I sometimes write the titles to my blog posts before I write the posts themselves. That is what happened with this post, but now I am derailed but I am going to keep the title because it is still apt. I just finished reading the June 3, 2013 issue of OT Practice. The cover story is entitled 'On the Go: Safely Transporting Children with Special Health Care Needs.' This is an excellent article, full of practical and relevant information about the topic. The Riley Hospital for Children at the Indiana University School of Medicine has blazed this trail for years and years - and that fact bothered me because I could not understand why I was reading yet another article about child passenger safety as if it was the first article being written. I totally appreciate the article; I just don't want to see any more calls arguing about HOW or WHY this is a legitimate area of concern. I think it should be established by now.